Lead Levels in Children - What do they Mean? The Health Department is telling you that your child has lead in his or her blood. At what level is this critical? At what level must you take immediate action? Blood lead levels are abbreviated as follows: BLLs > X µg/dL. This means: Blood lead level greater than X migrogram per decileter of blood. For example: a level of ten is abreviated: BLLs > 10µg/dL. The normal level of blood lead is zero, as there is no safe level of lead. Health department surveliance puts its greatest efforts on identifying cases where the BLLs exceeds 10 (10>µg/dL). As the level goes up, the potential for serious developmental problems escalate. BLLs above 15, require specific action be taken by the health deparment in most states. BLL above 30 become serious basis for concern and BLLs above 70 create a probability of seizure, profound disability and even death. One- and 2-year-old children are at greatest risk for elevated BLLs because of increasing mobility during the second year of life, resulting in more access to lead hazards. In addition, the developing nervous systems of young children are more susceptible to the adverse effects of lead. Be extra vigilant with children between the ages of 12 and 36 months (1- and 2-year-old children) because BLLs tend to be highest in this age group, and more children in this age group have BLLs > 10 µg/dL. In other words, more children are effected, and those effected have higher levels of poisoning. The most important thing to remember is that any lead can be potentially harmful. They call it lead poisoning for a reason: your child has been poisoned. The most significant question is not how much lead is in my child's blood, but is my child showing symptoms of lead poisoning. Click here for a list and explanation of the symptoms of lead poisoning. 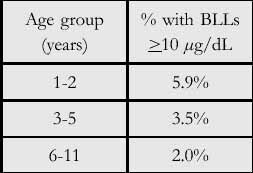 Percentage of children ages 1-11 with with BLLs greater than 10 µg/dL by age group.